The hotel in Amsterdam (sorry three posts in a row for Travel Thursday and I’ve mentioned Amsterdam!) then again maybe the Hotel in Paris wins. Actually the people at the Amsterdam hotel were more friendly than the people at the Paris Hotel. 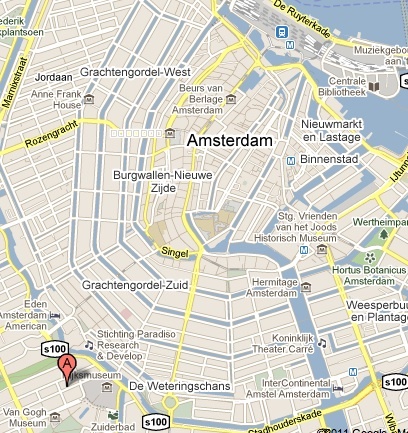 The hotel we stayed in, in Amsterdam is called the Hotel Acro. It was easy to find, you get the tram from the Centraal Station and then get off at Hobbemastraat – that simple. Apparently it’s about 1 minute walk from the tram stop – I’d say it was nearer 3 but I guess the first time you look for it, it’s always going to be a little longer than expected lol. It’s 2 star so I think they get a lot of families and backpackers because it’s relatively cheap – we were on the ground floor pretty much behind reception – I think you had to go up steps into reception anyway so it was kinda first floor if you count the basement as ground floor, we had an ensuite room and were on B&B fees. We were close enough to the centre that we could get takeaway from the main shopping area hop on the tram and get back to the hotel and it still be hot. We dropped off our stuff and then went for a wander – when we came back we were given a complimentary bottle of champagne (I think they were aware that it was our honeymoon even if we hadn’t said it lol). You can see Ian’s answer here. I don’t even know the best hotel I’ve ever stayed in. There’s been too many and I can’t remember? Recently, it was probably some chain hotel in DC I got stuck in when my flight got cancelled (looooooooovely). Your Amsterdam hotel sounds sweet.